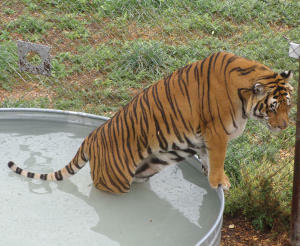 Wild Animal Sanctuary rescues Lions and Tigers and Bears Oh My! To be more accurate, 43 African Lions, 14 Mountain Lions, 70 Tigers, 87 Bears, 28 Wolves, as well as many other species; all of them carnivorous — with the exception of a single porcupine and a camel: a total of 290 animals, are all part of an animal rescue. He was only nineteen years old, but that moment prompted him into action. He rescued that Jaguar (Freckles) by getting permits to keep the big cat on his mother’s farm. And it was the catalyst that began a life that would be committed to rescuing abused and tormented animals: he created The Wildlife Animal Sanctuary thirty-one years ago and is still going strong in a lifelong commitment to animal rescue. they just received an additional 300 adjoining acres as a gift. Twenty-plus years after they initially began rescuing animals, and only after management took into account their ultimate safety and welfare, did TWAS open to the public in 2003. 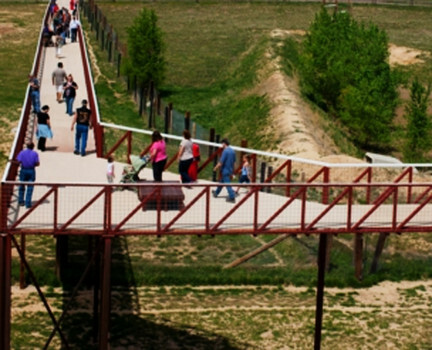 In 2012 the Sanctuary opened its Mile Into The Wild, an elevated walkway that takes visitors from the base of the entrance [just beyond the gift shop], past the animal indoctrination center, and then along the expansive open-areas where wolves, bears, tigers and lions roam. It ends at the Bolivian Lion Complex (a closed-in heated facility, built on short-notice to accommodate 25 lions rescued from Bolivia, South America). From inside the complex the lions have outdoor access that provides three separate prides with 20 acres each. From the walkway there is an unobstructed view, where the spectators are a non-threatening presence; the animals don’t perceive air-space as territory, making it a win-win scenario. There is also an area along the walkway set up with tables and chairs for those wanting to stop and picnic: there is also a snack bar located there. And an additional section was just completed that provides direct access from the far parking lot to the walkway, eliminating the need for visitors to utilize the shuttles from the overflow parking areas to the main entrance. A thirty-thousand square-foot welcome center is expected to be completed by the summer of 2013. 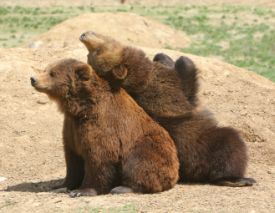 “Those bears there are Natasha and Tiny. Aren’t they cute together? They’re boyfriend and girlfriend. Our motto is OK to dating, no no to mating.” She went on to explain that even though they strive to stimulate the animal’s natural wild instincts –such as feeding the tigers three times a week to stay within the feeding schedule of a tiger found in the wild –, that it would be cruel to the offspring to be born into captivity. director) and his Sanctuary, and upon her graduation from college headed west from Georgia intent on working at TWAS; she is now the communications director. There are no guided tours at TWAS; all visitors are on their own due to the small staff. But they are building audio boxes where a spectator can press a button and hear a fact-filled audio of what they are seeing – and what they should be looking for – at that place along the walkway. While TWAS cares for nearly 300 animals, it is also the only sanctuary or zoo in the U.S. that maintains a full fleet of specialty air-conditioned animal transport vehicles. 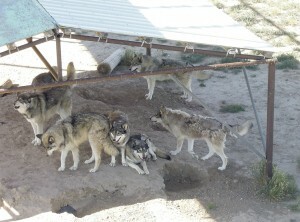 It uses them to rescue animals regularly — throughout the U.S, Canada and Mexico. But also, on occasion, works in conjunction with others to support the rescue of animals for other facilities. For example, in 2011 TWAS worked with USDA, IFAW (International Fund for Animal Welfare) and the Global Federation of Animal Sanctuaries to provide the vehicles to relocate twelve tigers — that would have otherwise been lost — to various facilities around the U.S.
Wandering this sanctuary one can’t help feeling humbled by the magnificence of these animals, and the care and effort that is provided to them by so many. It’s a reminder of the ripple effect that one person’s passion can create. In this case it began with a 19-year old boy. I highly recommend a trip out to The Wild Animal Sanctuary. You’ll enjoy the day, be amazed by the sites, while also helping to support a wonderful cause.